Sun, sand and palm trees call, sometimes, even if you live in the wonderful highland countryside of Volcan, Panama. So, one day in March, toward the end of Panama's "summer", my wife, Lydia, and I decided to venture forth from our pine-treed Shangri-La and spend some time on the sun-drenched beaches of the nearby Pacific Ocean. We came prepared with camper chairs, a large cooler, cold beers, hard-boiled eggs and our 13 year-old miniature Schnauzer, Spencer. 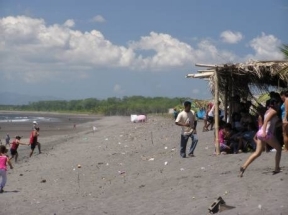 I was told the closest beach to Volcan was a blissful 45 minutes due south, at a place called Estero Rico. Our first mistake was choosing to go on a public holiday. Beaches should be enjoyed as an almost solitary pursuit. Trust me, having 10,000 people fighting with you for sand space takes away most of the fun. Thirty minutes after leaving our home, we reached the Pan-American Highway at the town of Concepcion. There are no signs for Estero Rico beach but, fortunately, a friendly gas station owner pointed me in the right direction. First, I had to load up on some bad food. That’s the great thing about trips like this: you can purchase potato chips and evil things like that without too many complaints from one’s spouse. I did however moderate my purchase to a small can of Pringles. I still have my boyish figure to look after. 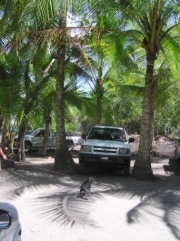 The road from Concepcion winds south for about 12 kilometers and just before you reach the small town of Santo Tomas you reach a “T” junction and the one and only sign for the beach. The sign read "9 kilometers to the beach". Good, I thought, we are at least on the right road. At Santo Tomas, there were a few more small convenience stores – more time to buy junk food. Then the paved road ended. The road was sandy and very dusty; at times, I had to brake as the dust of the vehicle ahead of me completely obliterated my vision. Nine kilometers later, we arrived at a palm tree shrouded grove absolutely packed with cars and buses. After some searching, I found the last remaining space and with inches to spare gingerly parked the car between two palm trees. I expected to walk through the palms and find myself on a beautiful sun-drenched white sand beach. Ah, the dreams of the deluded traveler! 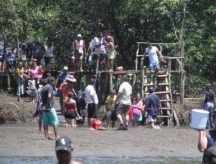 To reach the Estero Rico beach you first have to walk along a hundred yards of rickety catwalk. Then you need the services of a water taxi to take you across to where beach really is. Except the river was down and the water taxis weren’t operating. huge coolers hanging off their bodies. A dozen police officers also contemplated this watery transition but, one by one, the call of duty had them take off their boots and plunge into the river. Not wishing to appear as the wimpy gringo, I decided to follow suit. Taking the lawn chairs and the cooler would have been ridiculous, so we opted for the most important things – the digital camera (so we could document our stupidity), and Spencer. The water was clear and warm, and myriads of small fish swam past my feet. The river bottom was mainly sandy but did have the odd, strategically-placed sharp rock. My frequent expletives and cries of pain were testimony to the many times sharp rocks and soft gringo feet met each other. 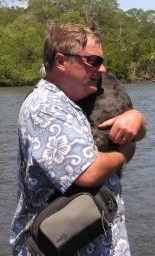 So there we were, in the middle of the river: a wading multitude of vacationing humanity – policeman, Panamanians, and two lonely gringos – one gringo having a somewhat bewildered Schnauzer sitting on his shoulder. On reaching the estero (my dictionary translates this as swamp or marsh, I thought it was the word for sandbar) we were greeted with a panorama of palappa huts – all serving beer, all serving meals of rice and beans. The sand island has no electricity. Not to worry, the ever-resourceful Panamanians have somehow managed to haul generators onto the island. These are used to power coolers (cold beer is good) but, sadly, they are also use to power sound systems that pump out that inane and mind numbing cacophony they call rap music (if that can be called music). We did avail ourselves of the odd cold beer and then. deciding to heck with the cost, I put on my expensive leather running shoes and we waded back through the river to the mainland. I had promised Lydia a day at the beach, so we drove east for 17 kilometers to Las Olas Resort. They have a wonderful clubhouse with pool and an excellent dining room. We sat down in the dining room and promised ourselves a good meal with a possible cool glass of wine. Not to be. The waiter said we had to reserve our table. The room was half-empty so I couldn’t see the need for this but, dutifully, we went to the reception desk and said we wanted a reservation for lunch. The girl at the desk said the cost was “feeftee dollars.” Wow! I thought, $15 dollars each for brunch? That’s a bit over the top! But we were hungry, the resturant looked wonderful, so I forked over the money. We did return to Las Olas much later in the year and did manage to negotiate a better rate. The patio restaurant at Las Olas is now my most favourite spot in all of Panama. I digress, so back to the day of the debacle at the beach. Nearby was a typical Panamanian restaurant where the prices were reasonable, except they did not have chicken. I never eat pork at roadside or beach stands, having been the recipient of every kind of “revenge” there is from Montezuma’s through Somoza’s, and I didn’t want to add Noriega’s to the list. The final insult, was to my ears. There was an over-volumed disco blaring out the same inane “crap” music as at Estero Rico. Our day at the beach being a disaster we headed for David. The city was like a ghost town; even Mitsubishi Avenue was deserted. Every Davidian, it seems, was at the beach. All our favourite restaurants were closed, so we finally ate at the place that has most probably fed more hungry people than the World Food program – McDonalds. Still, it was sunny day, and the French fries and McNuggets were consumed with great relish. My wallet and clothes were still wet and my leather running shoes were most probably ruined, but the family had been out on an adventure together.